Everything you wanted to know about Sufjan and then some superfluous stuff. Following his 2015 album Carrie and Lowell, Sufjan Stevens further cemented his status as an ever-evolving and all-around brilliant artist. To pay respects to him, I’ve created a comprehensive guide that’s designed to 1) assist people who are interested in his work but don’t exactly know where to start, and 2) indirectly inspire pure and unchecked rage in the hearts of current Sufjan fans, who are sure to (and should be allowed to) vehemently disagree with certain aspects of these lists. We’ll start with a classic. One of the marks of a great songwriter lies in the effect created by the opening lines to their songs. However, a great opening line doesn’t always translate to a great song, and vice versa. For example, “Chicago” is arguably his best song, but in the opening line, Sufjan isn’t trying to do anything particularly special: I fell in love again. That’s it. He fell in love again. An opening line doesn’t need to be overtly poetic—all it needs to do is captivate your interest. With that being said, here are ten of Sufjan’s most poetic and most captivating opening lines. If you’re just trying Sufjan Stevens for the first time, perhaps you feel like it’s all a bit too polished, a bit too perfect or maybe too tight. While this may indeed be a valid critique, I’d like to introduce to you the third list, which will hopefully act as a sort of counter-argument to the idea that his music is, well, too perfected. Most people hear soft-spoken indie folk Sufjan, but I’m here to inform you that Sufjan is much more than that. Give one listen to this list, and you’ll see that he’s not exactly a tender, angel-voiced middle-aged man after all; no, in fact he’s far from it: he’s a madman. 7. Get Behind Me, Santa! In addition to being 1) a sensitive, introspective musician and 2) an absolute madman, Mr. Stevens also possesses quite the wit. Here are some of his funniest song titles. 8. Did I Make You Cry on Christmas Day? Well, You Deserved It! Let’s catch our breath for a minute. Yes, current and potential fans, these are actual song titles. Now let’s continue. 2. They Are Night Zombies!! They are neighbors!! They have come back from the dead!! Ahhhh! One could certainly make the case that a truly great artist, in whatever field(s) of art he fall or she falls into, will never cease to evolve (or at least attempt to evolve) their work. But the craziest part is, these changes always just seem to happen overnight. 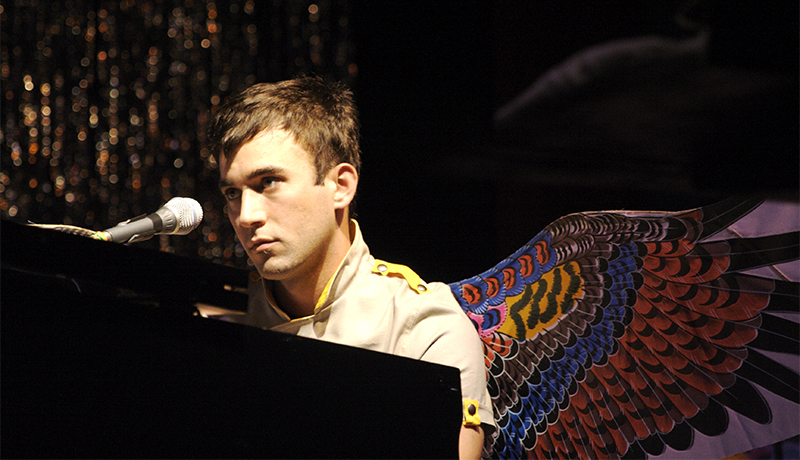 Sufjan Stevens is operating in an artistic world based on macroevolution. Odds are, he’ll continue to evolve just as rapidly as he has in the past because, well, that’s just what Sufjan does.